The weather has finally turned. I do so enjoy sunshine and fresh breezes. With the sun my energy level starts to rise and I feel the urge to ‘do’. Among the usual clean the yard and start the garden I wanted to set up a small area for a studio. Took a long time to move everything around in my bedroom. This was the room I chose, it’s small place and there was no where else to put it. 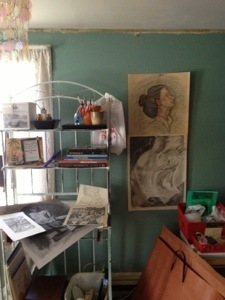 I like a clutter less room, but how to achieve studio and keep a calm clean room. I took a space near the window for natural light. 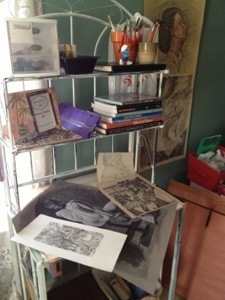 I had an old bakers shelf unit, added some pots and baskets on the shelves for pencils etc. next I took a piece of clear plexiglass and I can set it at angle for working and best part I can get a light under it to use as a light table. It’s a small spot, but I love it and its my own little studio.